"Yummy, fluffy eggs made in the oven." Preheat oven to 350 degrees F (175 degrees C). Grease an 8x8-inch baking dish with butter. Beat eggs, sour cream, milk, and salt in a bowl until blended. Stir in green onions. Pour mixture in the prepared baking dish. Bake in the preheated oven until set, 25 to 30 minutes. 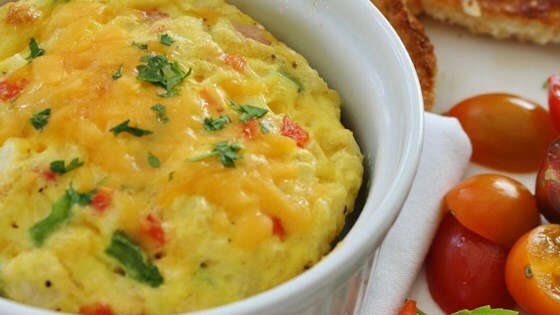 Sprinkle Cheddar cheese over eggs and continue baking until cheese is melted, 2 to 3 minutes more. Very simple but lacks flavor and is very dry. This made a wonderful dinner on a busy night after work. Served it with fruit salad. Adding to my recipe box. Easy and delicious recipe as is, but this time I added tomatoes, bacon, spinach and chives.